Tessa Hayes has been creating art ever since she could first hold a crayon and, as she prepares to graduate from the University of Maine Augusta on Saturday, she is hoping to begin a career as an art therapist. AUGUSTA — Tessa Hayes has been creating art ever since she could first hold a crayon. Now 35, Hayes realizes that art comforted her and helped her process her difficult childhood in Texas with a Vietnam veteran father who suffered from post-traumatic stress disorder. She saw how, for herself and others, art was a tool to build identity and to communicate ideas or emotions that a person doesn’t quite understand or isn’t allowed to express at home. “It came to be a substitute for words,” Hayes said. On Saturday, when she graduates from the University of Maine in Augusta, Hayes will take a step toward a career as an art therapist, helping others cope with mental illness, trauma or disability by creating art. Hayes, who lives in Vassalboro, has won UMA’s Distinguished Student Award. She was nominated by associate English professor Ellen Taylor and assistant professor of American studies Sarah Hentges, who praised Hayes for throwing herself into both academic work and civic engagement, all while working and raising two children. Hayes has been a stay-at-home mother and an early childhood educator. After years of considering a career as an art therapist, she enrolled at UMA in 2009. She started out in the mental health and human services program, but it didn’t accommodate the art courses she needed as a prerequisite for graduate school or the social justice work she hopes to bring to her career. So Hayes became one of the first UMA students to design her own interdisciplinary major. She has three advisors — one for art, one for cultural studies and one for mental health — and had to map out her course of study in a proposal reviewed by top academic officials. 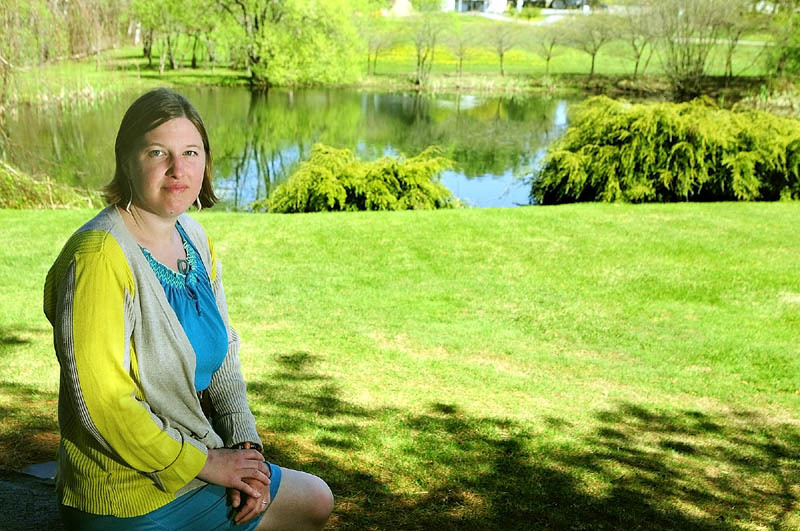 She’s working as a behavioral health professional at Gallant Therapy Services in Augusta, and in July she’ll start a three-year master’s program at Lesley University in Cambridge, Mass., to get her counseling license. Hayes said she’s eager to explore more social justice issues at Lesley — one of her first courses is about power, privilege and oppression — because she wants to help prevent mental and emotional trauma, not just help people through the aftermath. “I think that part of what I developed as an idea at UMA that I’m carrying over is that not only do we need to be doing therapy, but we also need a social justice component to be active in the community and have conversations around what choices we’re making as a society,” Hayes said. The Vietnam War created multigenerational suffering in her own family, and Hayes is worried that the same thing is happening in families affected by the wars in Iraq and Afghanistan. Hayes said her favorite classes at UMA were part of an interdisciplinary “cluster course” that cemented her interest in the root causes of trauma, such as violence against women, overseas resource wars and damage to the environment and human health. In the cluster course, Hayes and her classmates learned about Latin American literature and memoirs from Taylor, community and consciousness in American studies from Hentges and electronic arts from assistant professor of photography Robert Rainey. They also traveled to Nicaragua, where Hayes immediately made a connection with the mothers of students at a poor, isolated school, despite knowing little Spanish, Taylor said. Hayes already has put her commitment to social justice into practice at UMA. Her capstone project this semester involved teaching Winthrop Grade School third graders about “peacemakers” such as American Indian environmental activist Winona LaDuke and the feminist writer bell hooks. She had the students talk about what it means to be a peacemaker and then paint portraits of peacemakers that were displayed in town. As president of the Honors Program Student Association, Hayes organized UMA’s participation in the Clothesline Project, which raises awareness about violence against women. Hayes has worked or volunteered in a variety of other capacities on campus, including as a peer mentor, a service learning assistant for the Office of Civic Engagement and as director’s assistant for the Danforth Gallery. Hayes said that getting to know so many people at UMA is going to make it difficult to leave.